I just now received word from home that Liberty has died. I think the Lord knew it was best to take her while I was here at my grandmother's house, as had I been there, I would have had to see her in distress, all the while knowing that I could do nothing. I thank Him for allowing it to happen the way it did, as He knows how much I loved her. Today has been very sad for me, and I just didn't feel like doing a video. We're on death watch for one of my goats, Liberty. We've known she's had a wasting disease (basically, cancer for goats) for a few month's now, so this isn't too much of a shock. Even so, that doesn't really ease the pain. 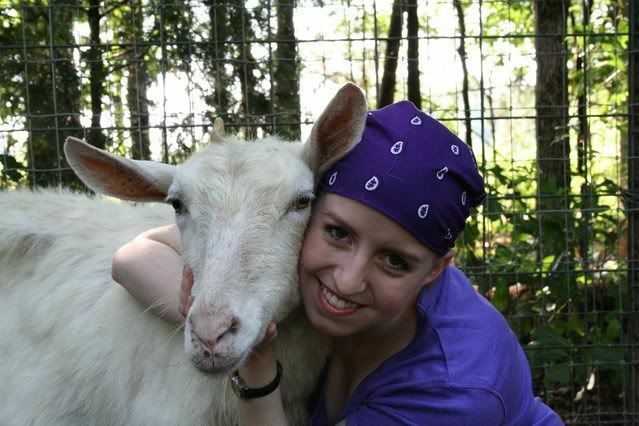 Liberty was one of the first two goats that began our small hobby farm many years ago. She was aptly named, as she was quite skittish and wild, and would never let anyone near her. In fact, we even have home movies of the boys trying to lasso her, just so Dad could clip her hooves. However, that all changed the day she gave birth to her first kid. At the time, we were inexperienced farmers, and we didn't even realize Liberty was pregnant. So obviously, I couldn't believe it when I walked into the goat shed one day and saw her struggling, trying to give birth. I watched her for a few minutes to see if she would need my assistance, and it didn't take me long to realize that she would, as the muzzle of the kid was just barely poking out. It was going to be a big one. I quickly ran inside, thoroughly washed my arms up to shoulders, grabbed some towels and a bottle of vegetable oil, and then ran back to the shed. By this time, Mom and a few of the boys were there watching Liberty, along with our Nubian goat, Pink, who spent the entire time moaning and stomping her feet out of distress for the sake of Liberty. She was Aunt Pittypat from Gone with the Wind, in goat form. I knew I had to hurry, as the water bag had already broken, and the kid might suffocate. I proceeded to hike my sleeves up as far as they would go, and completely slather my arms in vegetable oil for lubrication. Then I knelt down, and gingerly reached in. I felt all around inside the womb to make sure there weren't multiples, and if the kid's legs were in the proper position for delivery. I then became aware of exactly how huge this kid was. There was no way she would be able to deliver it on her own. By now, I'm up to my elbows in Liberty, and she's looking at me with pleading eyes to hurry up and relieve her from the pain. It was crunch time. I grabbed hold of the kid's two front feet, and waited for Liberty to start pushing. It's a very delicate situation, because if I pulled too hard or when she's not pushing, it could cause her to hemorrhage and die. I waited for my cue. Finally, I could feel her muscles contracting, and she let out a soft moan. I began to pull, but the kid barely moved an inch. I waited for the next contraction, and pulled again. Still, little progress. This birth dance continued: push, pull, rest; push, pull, rest. After what seemed like ages, all we had to show for it were two little hooves and part of the head. I knew it was now or never, so I told Mom to grab the head while I held on to the feet. Then, after one final push and tug, the kid came sliding out of the birth canal, and onto the straw-covered floor. It was alive, and it was humongous. We named him Una Gran Sorpresa (A Big Surprise). Ever since that day, Liberty has always responded to and trusted me over any other family member. If the boys are trying to load her into the trailer or take her somewhere she is unsure of, she won't budge until I take the halter and lead the way. Even when I'm out on my walks or working in the garden, she'll start bleating for me to come visit her, and won't quit until I do. We've been through a lot together, and, although this may sound strange, she has been my best friend. I love Liberty more than any other animal I have ever owned. I thank God for blessing me with her, and will always hold close to my heart the time we had together. She will be greatly missed.